McDonalds Wanganui Franchisee Darren Rowland has confirmed McDonalds Wanganui support of Wanganui Junior Rugby for another season. A sponsorship agreement formed in 2004, celebrating the 10th Anniversary of this unique business partnership. Dale Cobb (CEO) Wanganui Rugby is excited about 2014, including the introduction of new ideas that encourage our ongoing relationship, giving more commercial profile and brand awareness that represent their support of local junior rugby activities in Wanganui. We have nailed it this time, and the promotions will definitely benefit our junior rugby members every week through the winter rugby season. 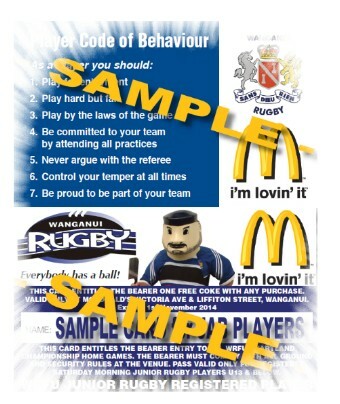 Design a WRFU/McDonalds ‘Code of Behaviour’ card that will be distributed to all registered junior rugby participants, with the offer of a free medium coke with any purchase. Under 13 & below will also be entitled free entry to all home Heartland Championship fixtures in 2014. This will also be available to Secondary School registered players, the only exception being, no free entry to Heartland fixtures. McDonalds Wanganui ‘Player of the Day’ certificates to every Saturday morning registered junior rugby team for the duration of the season in the wider Wanganui community rugby region. An exclusive set of McDonalds Wanganui ‘Team of the Week’ jerseys, will be manufactured, and will be available to one team every week for the duration of the competition. Open to all teams Under 6 – Under 13, this set of jerseys will be distributed to one lucky team, who will be required to wear these jerseys on game day. They will then make their way to the local McDonald’s Restaurant and receive VIP treatment of free burger and drink. That set of jerseys will then be returned to the WRFU for laundry and the process starts once again for the following weekend. McDonald’s Wanganui have been extremely loyal to our community sporting clubs and schools, and we appreciate the support that they provide our members. They are a Principal Partner Sponsor of Wanganui Rugby and our region ‘preferred family restaurant of choice’. Long may this association continue. So keep a close eye out for our weekly ‘McDonald’s Team of the Week’ photo gallery through the Wanganui RFU website www.wanganuirugby.co.nz. First games of the 2014 season kickoff Saturday 10 May. 100 years ago ~ The Day Rugby and War crossed paths ….